Elias was the second son of John and Jane Jones. He had an older brother, John William, and two sisters, Mary and Sarah. In the 1911 census Elias was a pony driver below ground in the colliery. He was 17 in 1911 and 25 when he died in 1918. At the time of his death he had served for 3 years and 4 months. 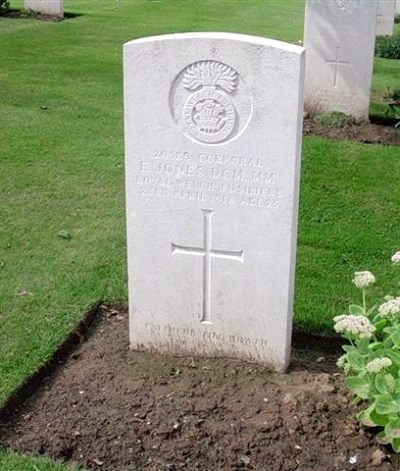 Elias was a stretcher-bearer in the 14th Battalion of the Royal Welsh Fusiliers. His distinguished war service is documented in the local newspaper, the Prestatyn Weekly. On 10th March 1917 it reported his promotion from private to full corporal along with the award of the Military Medal for continuous good work. In September of the same year it reported that he had been awarded the DCM “for his gallant work during the last great push in Flanders”. The informant goes on to comment what an unusual honour this was for a non-combatant. “Corporal Jones is the N.C.O. in charge of the stretcher-bearers of the Battalion, and they had a very trying time of it, for the ground was just like a morass – simply mud, slime and shell-holes, the whole way from the front line to the dressing stations, and when one realises that it took from two to four hours to carry a case, and that under continuous shell-fire and pitiless rain, one may have a vague idea of what a stretcher-bearer’s work is during an advance. Corp. Jones must have done exceptionally good work, for it is quite an unusual thing for a non-combatant to have two highly valued medals for gallantry conferred on him. It speaks very highly of his courage and devotion to duty …”. In November 1917 Elias came home on leave and was “the object of many hearty congratulations”. A concert was arranged in the Wesleyan schoolroom and Elias was presented with a gold watch and chain along with money raised from public subscription. The report of his death appeared in the paper initially on 4th May – an unofficial report from the chaplain who had conducted the funeral. 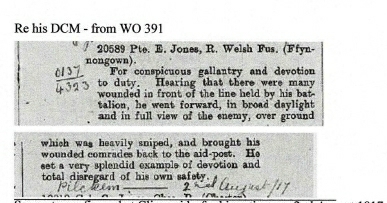 It was confirmed officially.on 11th May 1918, quoting a letter of condolence from the local MP, John Herbert Lewis, and a comrade, Sgt Sutton, who commented that he had fully expected Corporal Jones to be awarded the V.C., that he was “one of the bravest men in the division” and that “officers and men thought the world of him”.